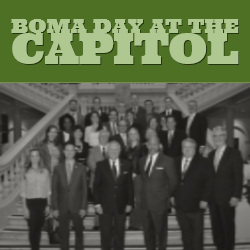 The Government Affairs Committee is hosting its annual BOMA Georgia Day at the Capitol event on Feb. 26, 2019 from 10:00 a.m. until 2 p.m.
BOMA Day includes a mixture of advocacy and education. You will interact on behalf of BOMA Georgia with elected officials, regulators and others involved in state policymaking. Additionally, if you are interested in seeing how the legislative process in action, you are invited to stay at the Capitol after the official BOMA Day program concludes to sit in on a House or Senate committee meeting.